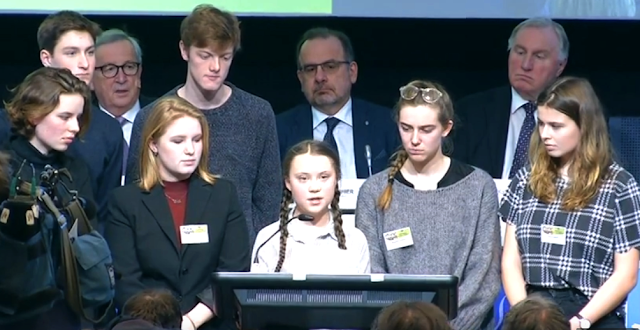 In the last week Greta Thunberg, the 16 year old Swedish climate activist, has travelled to Rome and met with Pope Francis, appeared before a 25,000 climate-strike Fridays for Future protest in Rome calling for increased climate action, and attended the Environment Committee of the Europoean Parliament in Strasbourg. They were all significant events and highlighted her important role as a catalyst in speaking truth to power in facing the climate crisis and climate breakdown, in motivating change and action by politicians. Greta's speech to the Environment Committee of the European Parliament was wide ranging and hard hitting, and came packed with some emotion in the delivery. "I want you to panic. I want you to act as if your house was on fire....To panic, unless you have to, is a terrible idea. But when your house is on fire and you want to keep your house from burning to the ground, then that does require some level of panic." She brought up the tragedy of the Notre Dame fire in Paris and the plans for it's rebuilding, and compared it to the civilisational sand castles we have been building, cutting corners, with foundations that are already trembling. She alluded to the IPCC 1.5C special report on global warming warning which warned that perhaps we have another 11 years to be well on the way to deep decarbonisation in all aspects of society to avoid passing tipping points in the climate system that would set off an irreversible chain reaction that would lead to the end of civilisation as we know it. social equity and climate justice "absolutely necessary to make [the Paris Agreement] work on a global scale." "We are in the midst of the sixth mass extinction, and the extinction rate is up to 10,000 times faster than what is considered normal, with up to 200 species becoming extinct every single day." The acidification of our oceans"
"But hardly anyone knows about these climate catastrophes, or understand how they are just the first few symptons of climate and ecological breakdown. Because how could they. They have not been told." says Greta. This is the heart of failing to listen to the scientists warning going back to James Hansen's testimony Congress in June 1988 (Yale Climate Connections Looking back 30 years), to the five Intergovernmental Panel on Climate Change (IPCC) reports that have been published reviewing all the science. The Fossil fuel companies have actually fostered and paid for campaigns of denial to forstall action. The media, with few exceptions, have failed in their journalistic duty of care to present facts and not provide a platform for false arguments. They have failed to tell the truth and the whole story to ensure populations are aware of what we are facing with climate breakdown. "If our House was falling apart..."
"If our house was falling apart you wouldn't fly around the world in business class chatting about how the market would solve everything, with clever small solutions to specific isolated problems. You wouldn't talk about buying and building your way out of a crisis that has been created by buying and building things." "If our house was falling apart you wouldn't be holding three emergency Brexit summits, and no emergency summit about the breakdown of the climate." "If our house was falling apart you wouldn't be celebrating that one single nation like Ireland may soon divest from fossil fuels. You wouldn't celebrate that Norway has decided to stop drilling for oil outside the scenic resort of Lofoten Islands, but will continue to drill for oil everywhere else for decades. It is 30 years too late for that kind of celebrations. "If our house was falling apart, the media wouldn't be writing about anything else. The omngoing climate and ecological crisis would make up all the headlines. "If our house was falling apart, you wouldn't say you had the situation under control and place the future living conditions for all species in the hands of future inventions that are yet to be invented. 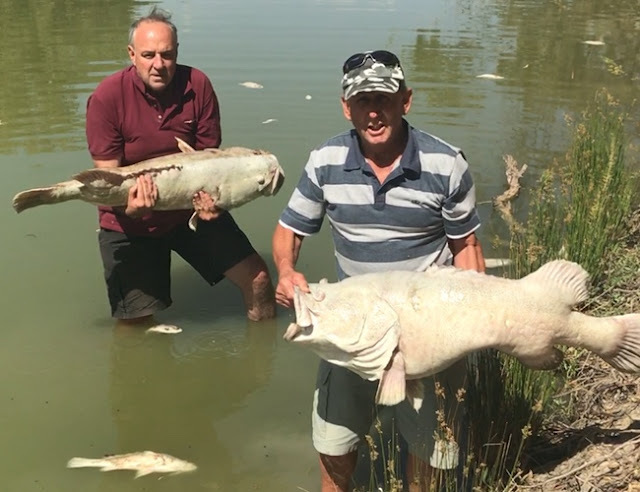 And you would not spend all your time as a politician arguing about Texas or Brexit." "Everything and Everyone has to Change"
Reminiscent of Naomi Klein's 2015 book "This Changes Everything", Greta argues everyone and everything has a duty to change. "Everything and everyone has to change, but the bigger your platform, the bigger the responsibility. 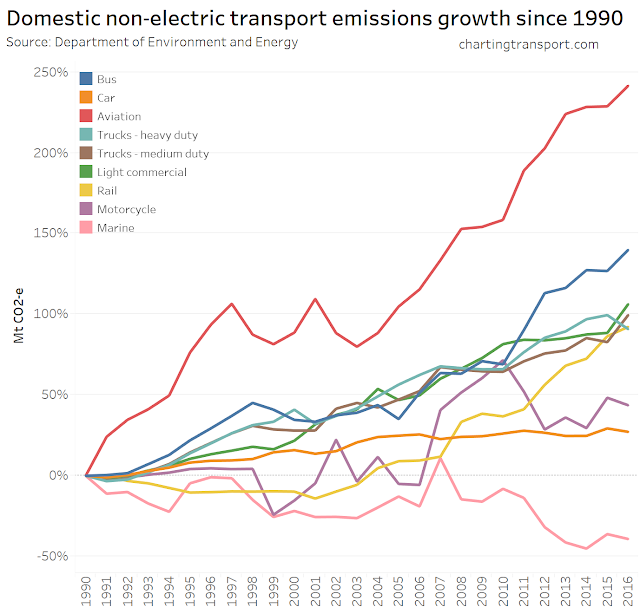 The bigger your carbon footprint, the bigger your moral duty." "When I tell politicians that they need to act now, their common answer is they can't do anything drastic because that would be too unpopular among the voters. And they are right of cause seeing that most people are not even aware of why those changes are required. That is why I keep telling you to unite behind the science. Make the best available science the heart of politics and democracy." 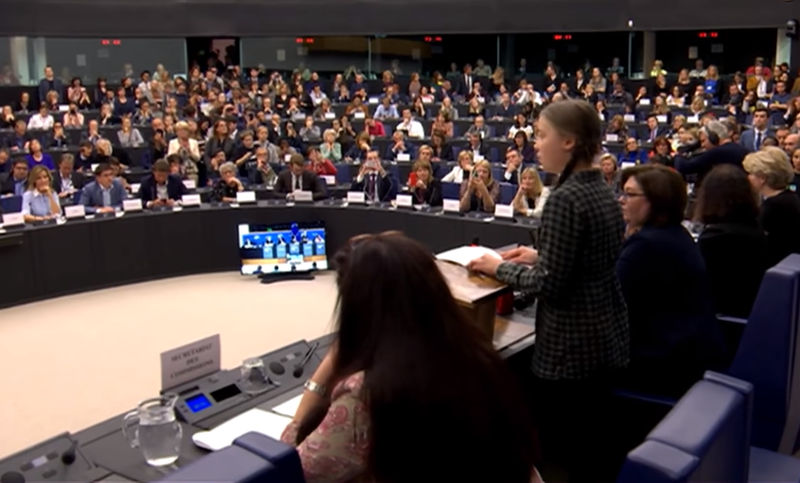 Greta raised the upcoming European elections, the fact that hundreds of thousands of climate strike students can't vote in these elections, that will determine their futures. "Some parties do not even want me standing here today because they desperately do not want to talk about climate breakdown." "Our house is falling apart. Our future, and what we have achieved in the past is literally in your hands now. But it is still not too late to act. It will take a far reaching vision, it will take courage, it will take fear and fierce determination to act now, to lay the foundations where we may not know all the details of how to shape the ceiling. In other words, it will take cathedral thinking." Greta was given a standing ovation. 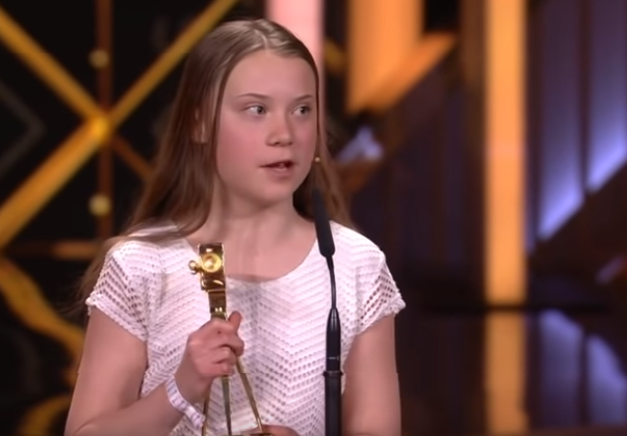 "Thank you for standing up for the climate and for speaking the truth", said Greta Thunberg "And really, it means a lot"
Pope Francis replied: "God bless you, and continue to struggle. Continue." and shook Greta's hand. A private meeting followed after the general audience. In May 2015 Pope Francis issued an Encyclical Letter LAUDATO SI’ which called for swift action to reduce emissions in taking care of our common home, Planet Earth. On Friday Greta was amid a crowd of 25,000 striking school students and youth in Piazza del Popolo. "Ciao Roma, you should be very proud of yourselves. Our future was sold so that a small number of people could make unimaginable amounts of money. It was stolen from us every time the adults said that the sky is the only limit and you only live once. They lied to us. They gave to us false hope. They told us the future was something to look forward to. Yes, some of us can have whatever we want, for now. Many of us can buy much more than we will ever need. But the only thing we really need is the future. Humanity is standing at a crossroads. We are here today because we have decided which path we want to take, and now we are waiting for the others to follow our example. In the last six months millions of school children, not least in Italy, have been school striking for the climate. To be honest there is no political change whatsoever in sight. That is why we have to prepare ourselves for that this will take a long time. We have to continue for a long time. This will not take weeks, this will not take months, this will take years. We children are doing this to wake the adults up. We children are doing this because we want them to act. We children are doing this because we want our hopes and dreams back. We should not be the ones fighting for the future, and yet here we are since basically no-one is doing anything. Some would say we are wasting lesson time. We say we are changing the world, so that when we are older we will be able to look back and say we did everything we could. And we will continue to do so. We will continue to fight for our future and for the living planet. Grazie Roma, grazie." A Response from Australia Pacific Airport (Melbourne) to my questions on runway expansion and aviation emissions. On my first question, regarding factoring in the possibility for development of east coast high speed rail and it's impact on flight projections, they utterly failed to answer my question. This is a big fail in their risk management and in their corporate business model. 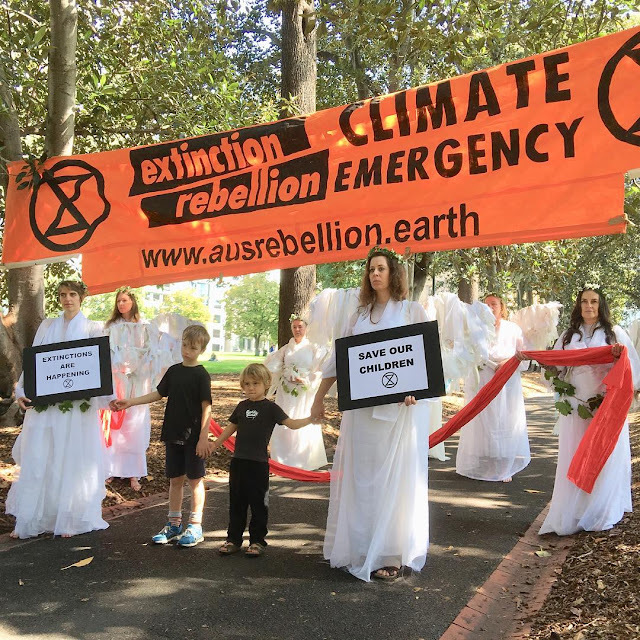 About 150 people attended Extinction Rebellion Day in Melbourne in the Treasury Gardens. There was no blocking of bridges, no arrests made. It was a pretty tame affair, really. The Climate Guardian angels were present and provided a note of solemnity. Composer and choir master Stephen Taberner was there and gave a quick workshop on street chants. There was a short march up to Treasury Place where the declaration was read out. A copy of the declaration was also handed to a security officer between the locked bars of the Australian Government offices. Melbourne Airport Corporation had a drop in session on 13 March at the Hume Global Learning Centre at Broadmeadows. I dropped in to raise that Melbourne airport needs to address aviation emissions growth as part of their business model for airport expansion. This also needs to be dealt with as part of their Risk Management Plan. 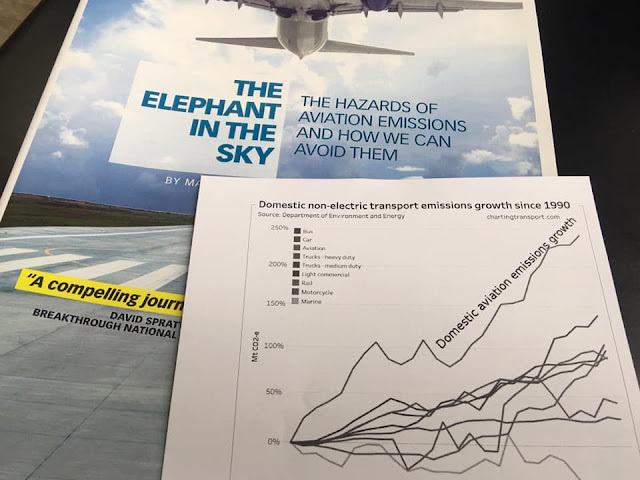 My presence sends a signal that Melbourne Airport Corporation need to start to address the issue of airport expansion inducing growth in aviation emissions and non-CO2 climate impact.